Fill up at one of our many service stations and support a Quebec family business! 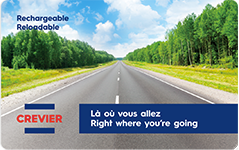 Our extensive network includes approximately 200 service stations across Quebec and northern Ontario. At Crevier, we’re committed to quality products and service that meets your expectations. You are always welcome to our sites where you can enjoy additional services, such as convenience stores or fast food. Several of our sites offer mechanical repairs and maintenance services specific to the model of your vehicle. Find the service stations near you to see a list of available services. Crevier gift cards can be reloaded and used to buy gas and convenience products, they are so practical! Find them at our participating service stations.